British police and security services have come under fire over the failure to stop three schoolgirls from traveling to Syria to become jihadist brides, despite one of the girls having tweeted a known Islamic State supporter. 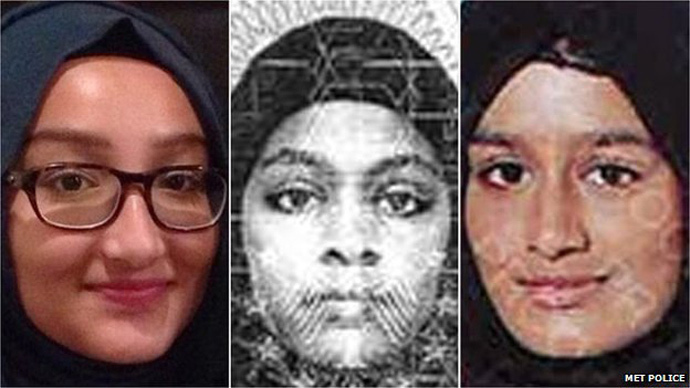 It is feared Shamima Begum, 15, Kadiza Sultana, 16, and Amira Abase, 15, who flew to Istanbul last Tuesday, may have already crossed into Islamic State (IS, formerly ISIS/ISIL) controlled territory. British police and intelligence agencies failed to notice a public message Shamima sent on Twitter to Aqsa Mahmood, a 20-year old from Glasgow who fled to join the IS militant group in 2013. Families of the girls have a right to demand an inquiry into the oversight, claimed a lawyer for the Mahmood family. Twitter also received criticism after it emerged Shamima was following dozens of IS extremists on social media. CCTV footage of the three schoolgirls, who disappeared from their homes last Tuesday during the half-term holiday, shows them walking through Gatwick airport on their way to catch a flight to Istanbul. It is believed the trio, who all attended the same school in East London, could be following a school friend who traveled to Syria last December. Emerging evidence indicates they may have been radicalized online. “The idea that a 15-year-old should make contact with Asqa, who is regarded as a terrorist, a member of [the Islamic State], yet no action is taken. Speaking on BBC Radio 5 Live, former foreign secretary William Hague said it was unrealistic for security services to notice everything. “You are looking for needles in haystacks. What’s remarkable is how often we do find the needle in the haystack,” he added. Hague went on to call for “updated” powers for security services to match changing technology. Warsi’s comments come as it emerges Shamima was following up to 70 Twitter accounts linked to IS extremists. Despite closing dozens of accounts linked to IS, Twitter’s policies enable new accounts to be easily created under different names. A spokesman for the social media giant said the company only takes action when alerted to inappropriate posts by other users. It does not monitor user content, he said. Families of the schoolgirls made emotional pleas on Sunday, calling for them to return home. Mark Keary, head teacher at Bethnal Green Academy where the three girls studied, claimed there is no evidence the girls had been radicalized at school. Speaking at a press conference on Monday, Keary said social media access at the school is strictly regulated.